Recently another food truck appeared outside my office. Like the rest of New York I am somewhat enamored of food trucks of late and of course had to try it. 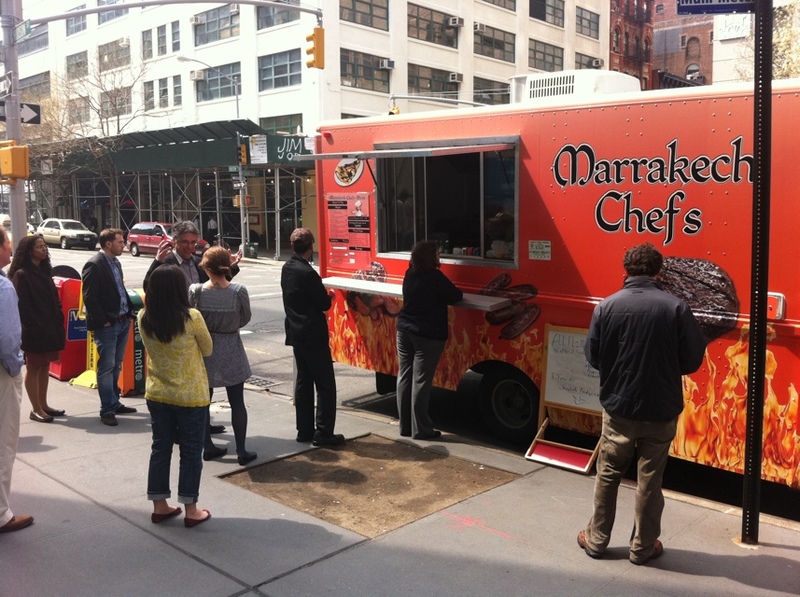 The truck was called Marrakech Chefs. Why, then, did they seem to specialize in burgers? They had 6 of them on the menu. When you think of Morocco, do you think of burgers? Neither do I. OK, admittedly, maybe the guys themselves are from Marrakech, hence the name. But don’t you think you call it “Burger Truck” or some such? I don’t know… . 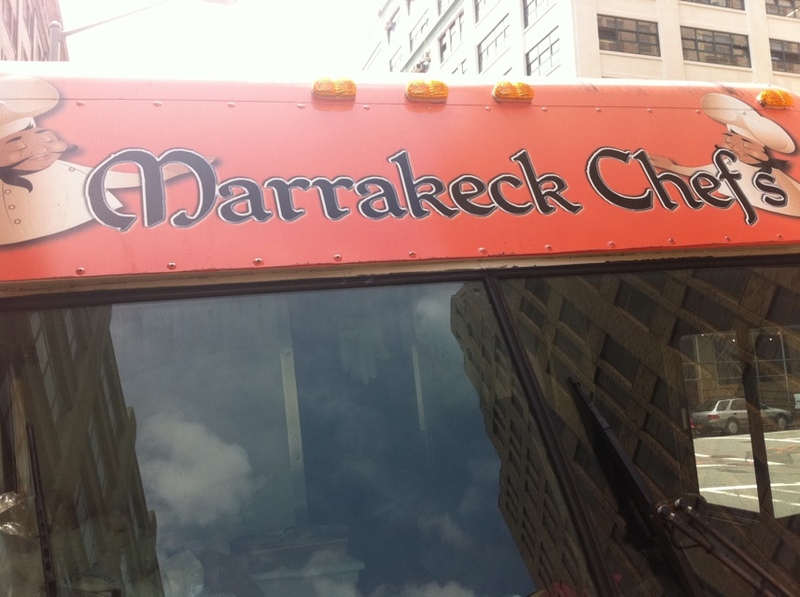 Or was it the 'Marrakeck Chefs' truck? And what was with the hilarious typo on the front of the truck? I’d’ve been livid if I sent the truck off for a custom paint job and had it come back like this. These things started to raise my concerns. The cartoonish colors of the platter jump out at you. Fortunately, when I stepped up to the counter and asked the gentleman “What’s good?” he suggested the merguez sausage platter. I got it with the couscous. It was served with roasted peppers and a potato salad. The hefty platter cost just $8. 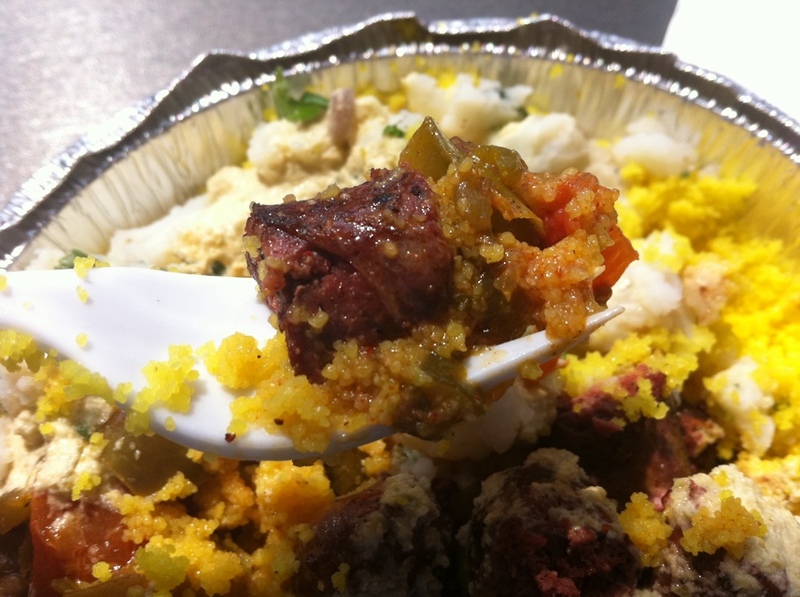 A forkful with sausage, peppers and couscous. The sausage was soft and crumbly with a faint, simmering spice. Texture-wise, it had a vaguely crumbly, mealy quality which I was not wild about, but the sweet flavor of the lamb-beef mixture was quite pleasant. The roasted peppers were of course sweet, and they worked well with the texture of the sausage. 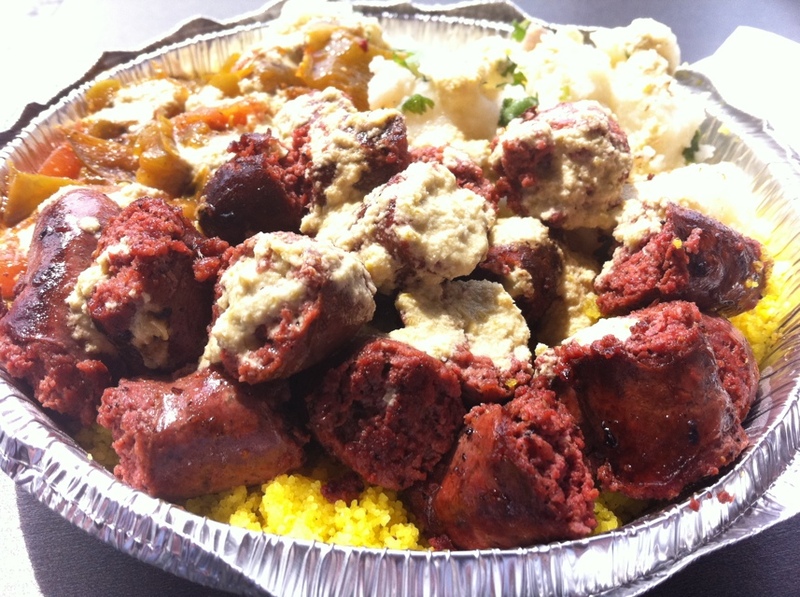 The couscous themselves were also on the sweet side. 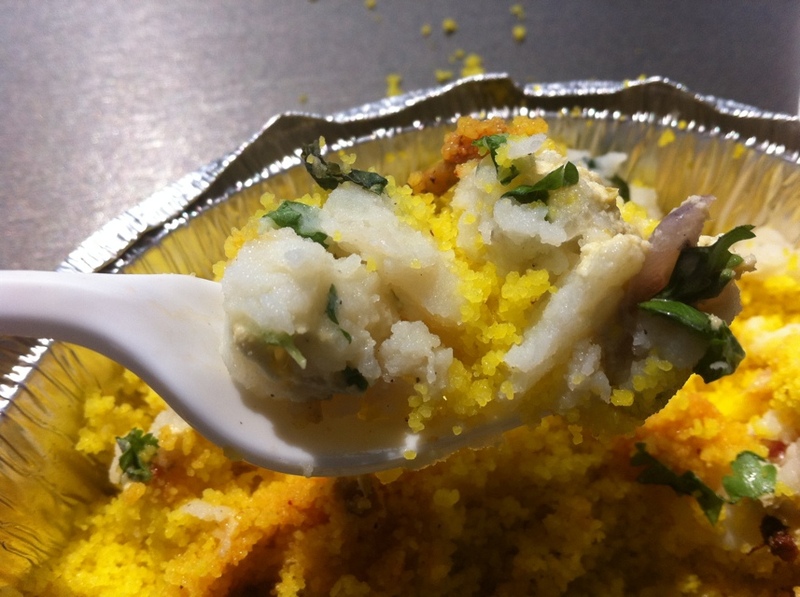 Putting the whole thing together in a forkful yielded a buttery richness to the experience. The scene-stealing potato salad was wonderful. The potato salad was excellent, especially as a palette cleanser. It offered the right level of vinegar. Frankly I think it sort of stole the show. It’s a hefty portion, and somewhat different, but I don’t know how motivated I am to go out of my way to get it. Travels around the city, no apparent website. ← The Five Napkin Burger Lives Up To Its Name, But Is That A Good Thing? It takes a degree of courage to eat from a food truck that can’t even get its own name right.